South Africans were hit by the first sales tax increase since apartheid when the finance minister delivered a tough budget on Wednesday, dampening optimism spurred by the country's new reformist president. President Cyril Ramaphosa took over last week from the scandal-plagued Jacob Zuma, raising hope for a turnaround in the economy that slid into recession in 2016 and has grown sluggishly since. Finance Minister Malusi Gigaba warned in his speech to parliament in Cape Town that "this is a tough but hopeful budget" as he announced Value Added Tax (VAT) on sales would rise by 1 percentage point to 15 percent. The new rate is the first hike since the end of white-minority rule in 1994. "We have not adjusted VAT since 1993, and it is low compared to some of our peers. We therefore decided that increasing VAT was unavoidable if we are to maintain the integrity of our public finances," said Gigaba. It is hoped that the increase, coupled with adjustments to income tax brackets, will raise some 36 billion rand ($3 billion) for the public purse in 2018-19. The policy is a gamble for the ruling African National Congress (ANC) as it could hurt its poor and black middle-class electoral base going into elections in 2019. "The current zero-rating of basic food items... will limit the impact on the poorest households," Gigaba said. Social grant benefit payments to the poorest South Africans would also increase above the rate of inflation, he said, to mitigate the impact of the VAT hike. "For the poor its an issue," said University of Cape Town professor Co-Pierre Georg. "If you live on an extremely tight budget and have to count every rand you have, it will affect what you can buy." Gigaba also announced that duty on luxury goods would rise 2 percentage points to 9 percent and the so-called "sin tax" on alcohol and tobacco products would rise between 6 and 10 percent. Despite being Africa's most developed economy, South Africa grappled with weak growth, ballooning national debt, depressed investor confidence, record unemployment and junk status on its bonds during Zuma's nine-year tenure. Growth rose to 0.9 percent last year from a paltry 0.3 percent the previous year. Analysts forecast this year's growth will jump to 1.8 percent. The budget's proposals to generate an additional 36 billion rand in tax revenue will be essential to fund free university education for students from low-income families -- a policy abruptly announced by Zuma on the eve of his departure from the ANC presidency last year. Under pressure to remove ministers closely allied with Zuma and blamed for aiding state corruption, Ramaphosa told lawmakers on Tuesday that he will announce a new cabinet at an "appropriate" time. Gigaba, who is widely seen as a Zuma loyalist, jokingly asked Ramaphosa "how much time do I have, sir?" as he started to deliver his speech. "Gugaba has this tainted history and the problem with him delivering the budget is that people know that he has been involved so intimately (with alleged corruption) and cannot signal to international markets a credible turnaround," said Georg. Since Ramaphosa was sworn in as president, the rand has strengthened, the bond market is at its best level in almost two years and local equities rose nearly four percent on Friday when Ramaphosa delivered his maiden State of the Nation Address. "The markets believe Ramaphosa is good for our economy," said Ken Swettenham, a financial analyst at Liberty Life. "There is positive sentiment." But opposition parties remained unconvinced. 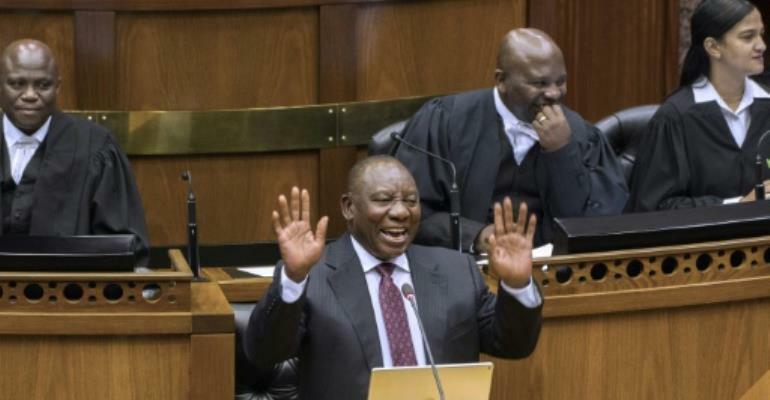 "(Ramaphosa) has made some bland, very nice sounding statements about what he is going to do, but the proof is in the eating of the pudding," said opposition Democratic Alliance's shadow finance minister Alf Lees.